GIVEAWAY! 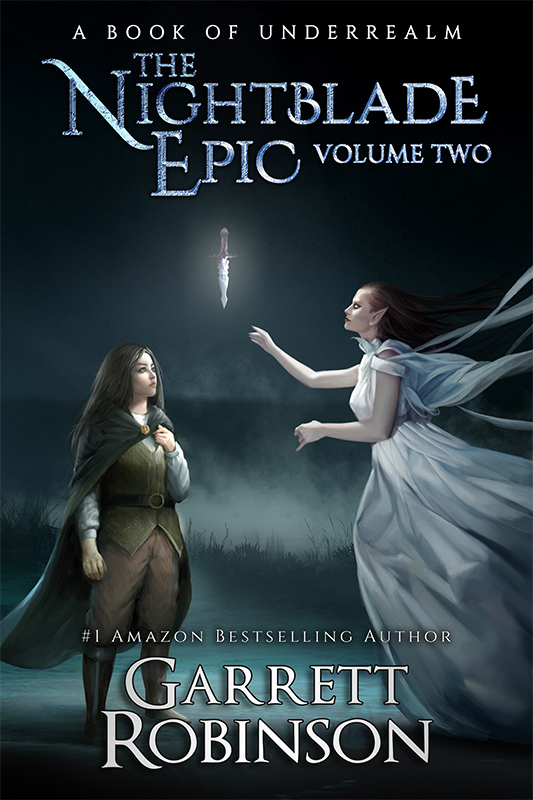 The Nightblade Epic Volume One PLUS A NEW THING! Hello Rebel, and welcome back to my life! Ooh, we got an exciting one for you today! I’m excited! Are you excited? I’m excited. We are precisely FOUR days from the release of the Nightblade Epic Volume One in hardcover, this gorgeous book I’m holding right here in my hands. There’s a link in the doobly-doo where you can go pick up your copy if you haven’t already, and as a reminder, the hardcover and ebook editions are ON SALE until Tuesday when the book comes out. Now, as is tradition when a new book comes out, we’re doing a giveaway, but this one’s a little bit more special than most. So people on my email list received an email this morning, and if they responded to it, they were automatically entered to win one copy of the Volume One hardcover. And by the way, we do that kind of thing all the time, which is a really good reason to be on the email list if you aren’t already. That link is also in the doobly-doo. We also have a post in the Underrealm Facebook group right now, and anyone who comments on it is entered to win ANOTHER copy of the Volume One hardcover. And if you’re watching this video right now, YOU can leave a comment down below and be entered to win ANOTHER copy of the Volume One hardcover. But as discussed, this book is something extra special, and so we’re doing something extra special for this giveaway. Because the Volume isn’t the only new thing I’ve been working on, and the other NEW thing is also ready to share with you. If you’ve followed me for a while, you know I’m a bit of a t-shirt collector. A connoisseur, even, you might say. I love showing off the things I love with a thing I put on my body. It’s a little bit more than just buying a book or watching a show, and a little bit less than, say, getting a tattoo. Though I have one of those, too. If you didn’t already know. This one right here, because I kind of love The Lord of the Rings, if you weren’t aware. And I’ve wanted, for a long time, to have an Underrealm t-shirt. I mean, hopefully some other people would want to wear it, too. But to be totally honest, I kind of just wanted one myself. I mean, spoiler alert: I like my books a lot, and the world I’ve created within them. But then the question became, what would I put on an Underrealm shirt, anyway? It’s not like I’ve got a plethora of art, other than the art on my book covers. And a full four-color picture doesn’t always translate super well to a shirt. It’s hard to get them to look right, and the look can fade away super fast. No, you’re better off going with a super simple design that can be rendered in as few colors as possible. In fact, the best thing to do is just to get a single symbol rendered in a very simple style. One color, if possible, on a single color background. And then, when my incredible cover artist Miguel Mercado did the cover for Mystic—this one right here—I finally knew what the first Underrealm shirt would be. Because the Mystics of Underrealm wear a badge. A symbol of office, like a sheriff’s star, but a lot cooler. They all wear red cloaks, and on those cloaks are pinned this symbol, which you can see right here on the cover art. That’s actually a symbol I’ve had in my head since I was a wee little boy. Don’t know where it came from, but it’s been on my mind for literally decades. And now that symbol has been fully realized, and it’s available on the first official t-shirt of Underrealm, and HERE IT IS! I love this thing so much, I want to put it on right now without taking off the shirt I have on, so let’s use some MOVIE MAGIC. This thing is absolutely gorgeous, and I cannot think of a better thing to have on my person to show my enthusiasm about the books—even if most people kind of won’t know what that is. So anyway, back to the giveaway. The final way to enter this week’s hardcover giveaway is to send me a picture of you, HOLDING a physical print book from Underrealm. I don’t care what book it is, as long as it’s in print. And I don’t care how you send it to me. You can send it via email, or post it on social media and tag me, whatever you want to do. And from the people who send me their pictures, I’ll select ONE person who will not only receive a signed hardcover copy of Volume One, but ALSO a free Mystic t-shirt! But like all the giveaways, this one ends on Sunday morning at 7:00pm Pacific Time, so make sure you do it quick! And that’s what I’ve got for you today, Rebel. The new book comes out in just three days, I’m VERY excited, as you can probably tell. Subscribe to the channel if you haven’t already, send me your pictures of you holding a print book, and I will see you on Monday. Byyye!